When in Paris, one walks a lot and it’s worth doing as there are so many sites to see. But you can walk down a street and not even realize you’ve passed a historical monument or famous site. I recently discovered that you can see the Bastille fortress—yes, that famous ‘storming of the Bastille’ place—-that made July 14, 1789 famous. I found the remains of the Bastille in the most unlikely places, so if you’re in these four areas, be sure you’re on the lookout for the remnants. You’ll be looking at a little history from 228 years ago. 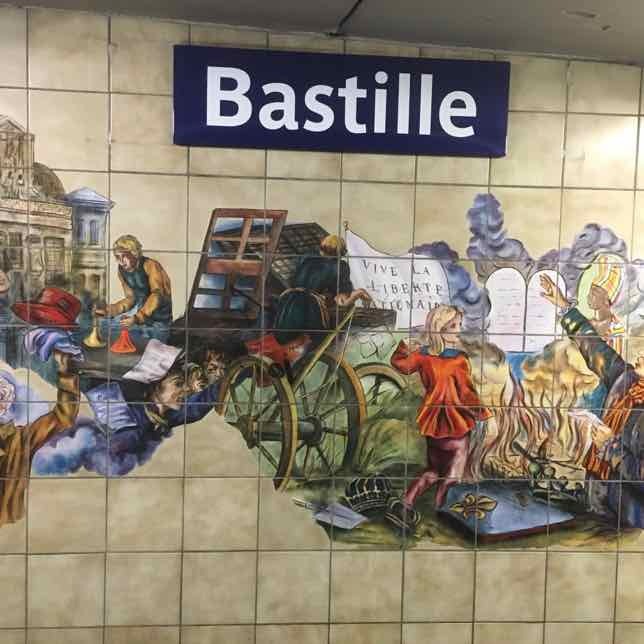 It’s not all rocks, either, particularly at the Bastille Metro where you will see some amazing art (from France’s bicentennial). 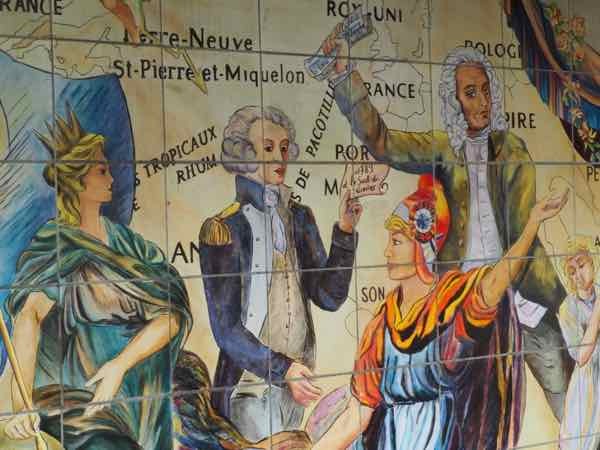 Today, July 14 is a national holiday called “La Fête Nationale” (Bastille Day in English), but July 14, 1789 was significant for marking the beginning of the French Revolution and the day that the storming of the Bastille took place. 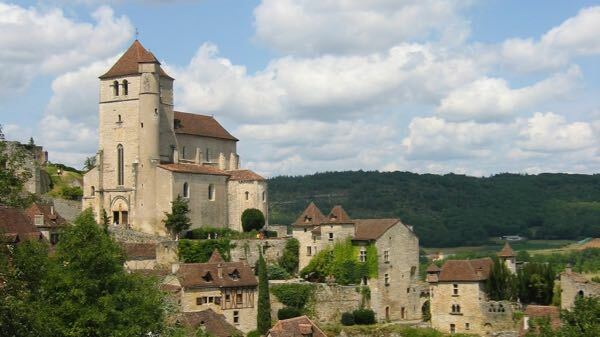 The mobs wanted the arms and ammunition stored in the fortress which had also imprisoned opponents of King Louis XIV. 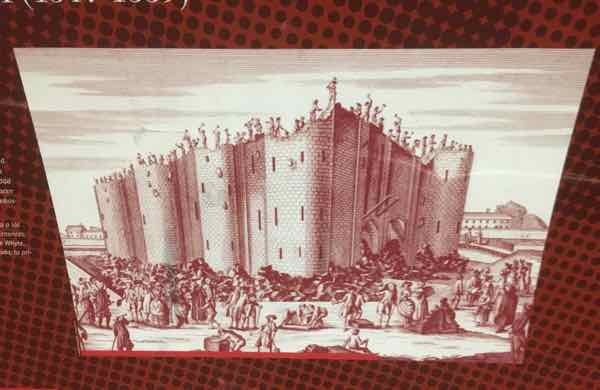 The Bastille was originally constructed in the late 1300s to protect Paris from opponents during the Hundred Years’ War and then it became a prison in the early 1700s. 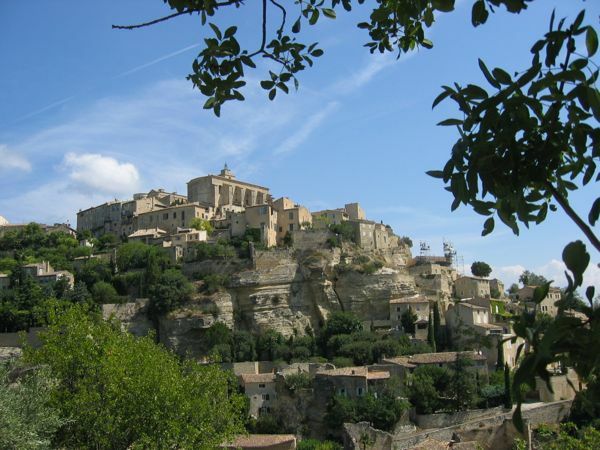 To the general public, the fortress was seen as a symbol of royal extravagance and authoritarianism. So when the mobs stormed the Bastille to get the munitions, they were also rebelling against royalty. 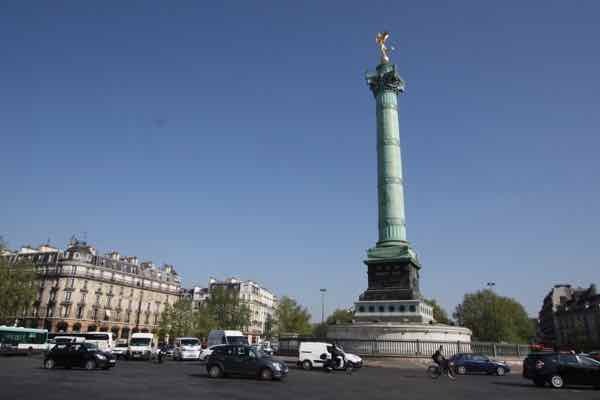 Today, the area where the fortress stood is called Place de la Bastille and in the centre is a large column, but it has nothing to do with the history of the Bastille prison. It is called the July Column (Colonne de Juillet)or “Génie de la Liberté” (Spirit of Freedom) and it commemorates the revolution of 1830, also called the “July Revolution”. Everyone today associates it with the July 14, 1789 revolution. The Bastille today no longer exists, except in small pieces scattered throughout Paris. After the revolution, the fortress was demolished and individual stones were taken away as souvenirs or used in the construction of roads. Place de la Bastille is now a busy area with the Opera Garnier, many restaurants, and stores. It also has the excellent Marché Bastille every Thursday and Sunday. It’s one of Paris’ largest markets on Boulevard Richard Lenoir. Just down the street from Place de la Bastille is a quiet oasis called Promenade Plantée. The Musée Carnavalet has a number of artifacts from the revolution as well as a model of the Bastille made from some actual stone. It was carved by Pierre-François Palloy, the building contractor who organized the dismantling of the Bastille after it was stormed. The museum is closed, however, for renovations until the end of 2019. 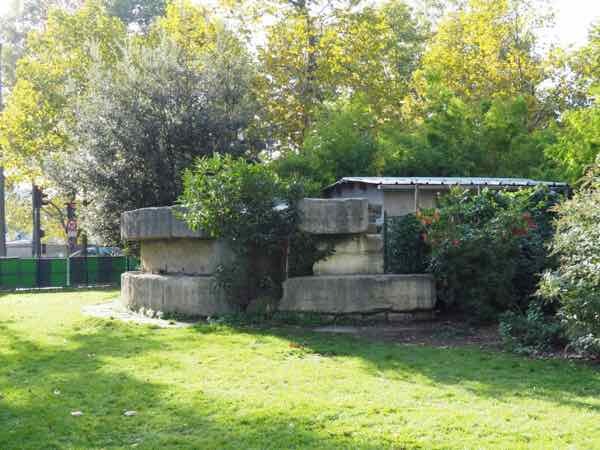 Here are a few places in Paris where you can still see the remains of the fortress. 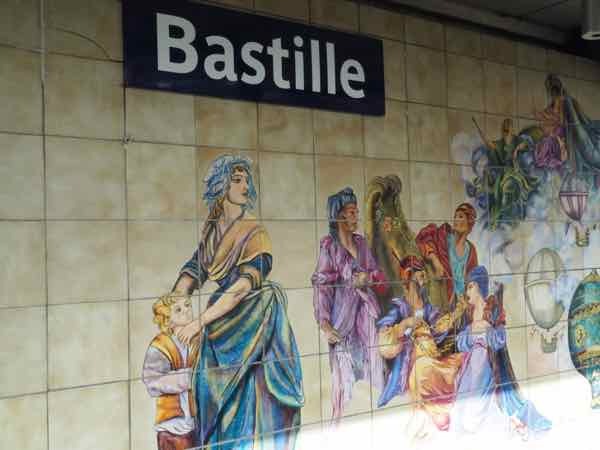 `The Bastille station is a sprawling maze of tunnels and there are two sites worth seeing. 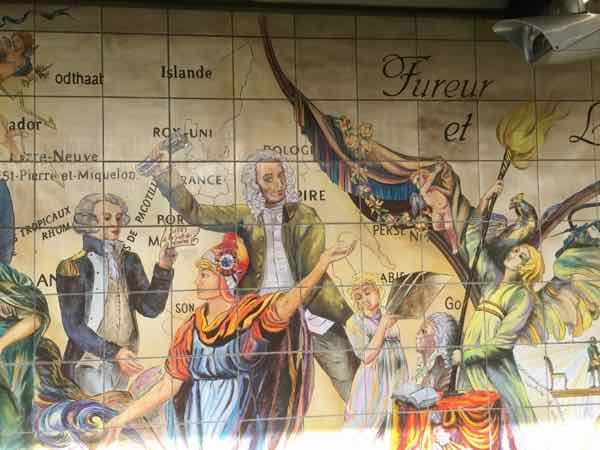 Go to where the platform for Line 1 (either side) and you will see murals recreating events during the revolution. 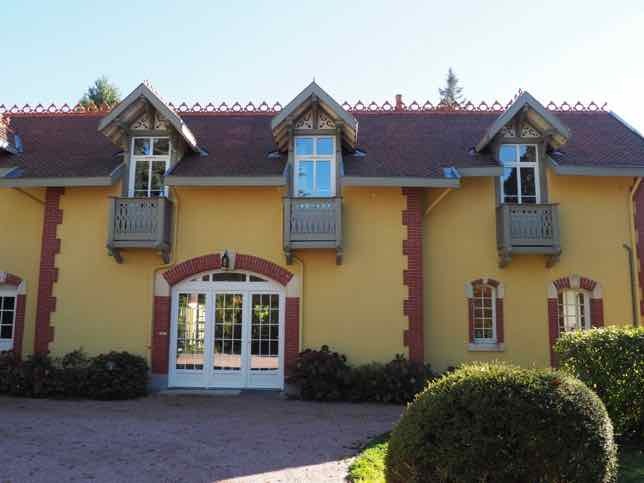 They were created by Liliane Belembert and Odile Jacquot in 1989 to celebrate the 200th anniversary of the French revolution. 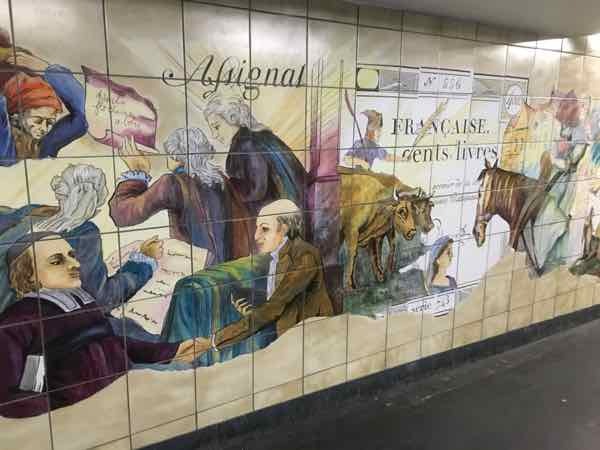 Then go to the Line 5 platform (direction Bobigny-Pablo Picasso). 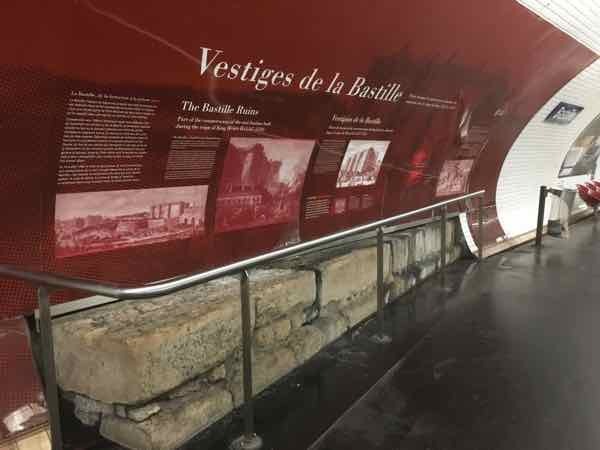 It connects with Line 1 in the Bastille station and here you will see pieces of the fortress’ foundation that were discovered in 1906 when work was being done on Line 5. 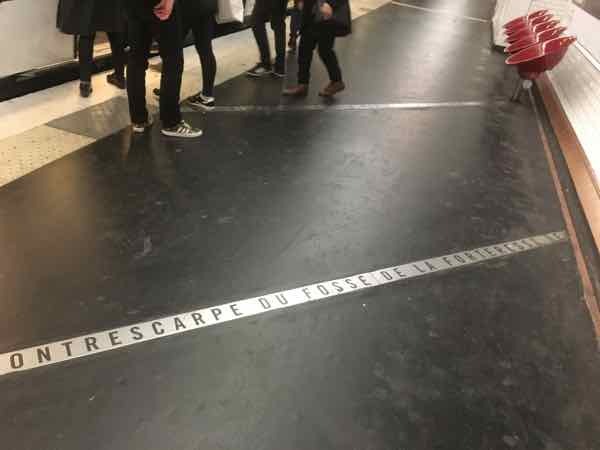 They decided to leave the archeological site in tact in the Métro. You’ll also see an outline on the platform. This represents the eastern moat walls of the Bastille. The fortress walls are outlined in red stones on the street. You have to look carefully around Rue St. Antoine to even notice them. A large piece of the Bastille was found in 1899 when Line 1 of the Metro was being excavated. 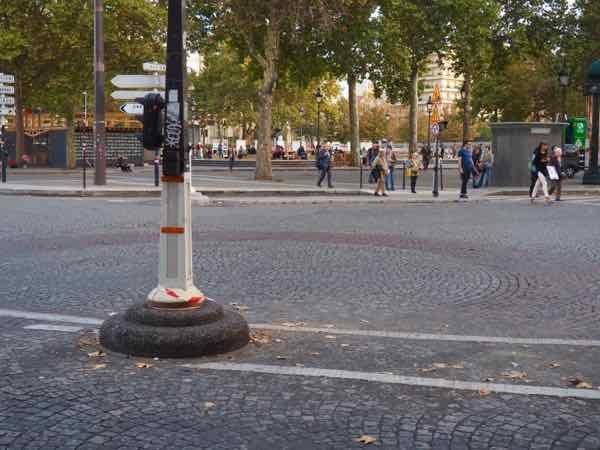 The remains of the foundation were from one of the 8 towers (Liberty Tower) and it was moved to Square Henri-Galli which is down the street from Place de la Bastille. In this square there are swings and I noticed parents and children there playing. Little did they know that in that same square was a piece of history. It’s pretty unrecognizable and I couldn’t even find a sign indicating its importance. After the storming, many stones were used to pave the streets. Many were used to construct the bridge, Pont de la Concorde. So, now you know where some of the remains of the Bastille are and if you are at any of these locations, you can see a bit of history. 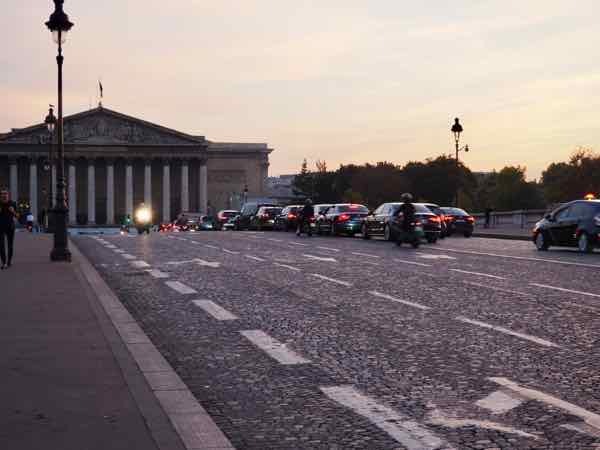 If you are in Paris on July 13, the night before Bastille Day, expect to have celebrations at night with lots of firecrackers going off, especially at Place de la Bastille. Yet another place you can find “remains” of the Bastille is in Virginia, of all places. The giant metal key that unlocked the gate was presented as a gift to George Washington by his friend Lafayette. It now hangs in Washington’s home in Mount Vernon, Virginia. Yes I remember reading about that. Thanks for sharing.